Below you will find a list of all the EU Casino bonuses - offered to new players. The right side offers a casino overview (click to scroll through the images). EU casino is one of only 10 online gambling brands powered by SkillOnNet software. Casino games are exclusive and enticing, bonuses and promotions are seemingly never ending, and support services are more than adequate. It's a flashy betting site that offers play in 21 languages and nine currencies, including Canadian dollar. The 50 plus unique games are not yet available on the mobile platform, so you'll have to wait a little longer to experience 3D, progressive and multiline slots and table games on your iPhone, iPad or Android device. All indications are that growing numbers of Canadians are signing up at the one of a kind gambling venue. Locals from far and wide, including the Yukon, British Columbia, Ontario and Alberta, have made their mark on the growing international player base. The company has recognised the interest from the northern climes and has tailored its banking options, bonuses and support services for both English and French speakers. We chatted to an EU casino host recently, and he confirmed that a posse of Canadian players had been paid out in CAD. The games of choice included Dr Magoo, Secret Agent and Kiss the Sky multiline slots, Deuces Wild video poker, and Double Heaven, an inimitable dice-based game exclusive to the software brand. The EU casino bonus is a 100% up to 50 MegaSpins on your first deposit only. The spins will be awarded on the Spina Colada slot and must be used within 30 days before they expire. Players need to make a minimum first deposit of $10 and will receive 1 MegaSpin for every euro/dollar deposited up to a maximum of 50 MegaSpins. This promotion is only available to new players and is subject to wagering requirements. The casino's full terms and conditions apply. The promotions page at EU casino are literally overflowing with player perks. There are free cash offers, no deposit bonuses, cash backs on new games, free spins on selected slots, VIP reload bonuses, raffles, prize draws and more. All are easy to access, as each bonus or promotion has a dedicated code that is entered onsite. SkillOnNet software has an intriguing games suite comprising approximately 50 unique titles. There are classic, progressive and multiline video slots, some of which are in 3D. The superheroes from DC Comics - Superman, Batman and The Flash - are relative newcomers to the slots series. Apart from the comic book graphics, animations and audio, the games offer conventional game features, free spins and bonus rounds. 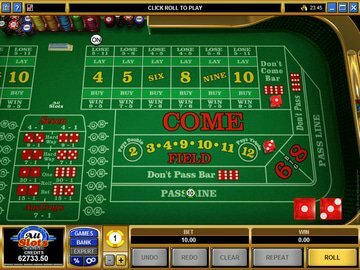 Classic card and table games such as blackjack, roulette, craps, Caribbean Poker, Pai Gow and Punto Banco are well represented, so too are a quartet of video poker variations. The full casino experience is available as a free software download, or an instant play version. The EU brand has not as yet evolved onto the mobile platform. The games suite, particularly the 3D slots, is perfectly suited for play on an iPad, iPhone or Android device. It shouldn't be too long before the exclusive titles are optimised for portable play, so keep an eye out for the emergence of an EU mobile site, and an associated no deposit welcome bonus code. Banking transactions are protected by 128 bit SSL data encryption technology, and are supported in multiple currencies including CAD, AUD, GBP, ZAR and EUR. 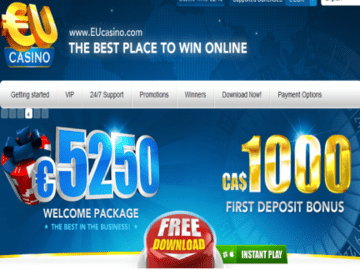 EU casino offers a comprehensive selection of deposit options that range from mainstream wire transfers and credit and debit cards to Canada-friendly web wallets and pre-paid cards. Payment processes include ClickandBuy, instadebit, uKash, UseMyBank and Click2Pay, all of which are readily available to Canadian players. The versatile playing platform is iTech Labs tested for randomness and fair play. Customer support services are available in 21 languages including French. Players can make contact 24/7 by email or phone. If you need help installing the software, redeeming a no deposit bonus code or coupon, or simply want to chat to someone about the promotions or games, you can contact the site, or click on the support tab onsite for clear instructions and advice. EU casino is an exciting alternative to the mainstream. Games are riveting and unique, bonuses and promotions more prolific than ever, and the entire platform is customised for Canadians. A major omission, that will hopefully be corrected soon, is the lack of a mobile client. The brilliant graphics and 3D imagery of DC licensed slots will surely make a major impact on digital devices, so here's hoping that an EU branded iPad, iPhone and Android casino emerges sooner rather than later.